Unless you’ve been living in a zombie-proof bunker somewhere in the backwaters, you know that Capcom’s  Dead Rising® 2 will be infesting all major retailers in North America today. The second installment in Capcom’s zombie action series introduces you to a new setting, a new hero, a new combo weapons mechanic and thousands more flesh-eating zombies. Launching on the Xbox 360® video game and entertainment system from Microsoft, the PlayStation®3 computer entertainment system and Windows PC this week, Dead Rising 2 promises to increase the carnage with tons of zombies on screen at any given time and countless new objects including everyday items players can combine to create superior zombie-killing combo weapons. Dead Rising 2 will introduce players to a new protagonist named Chuck Greene whose Motocross background and tragic past has brought him to America’s new gambling playground, Fortune City. He is there to compete in “Terror is Reality”, a gruesome game show that dares contestants to survive zombie-filled environments for big money prizes at the delight of TV audiences around the globe. Chuck’s motivation for taking part and risking life and limb is his daughter Katey, who since being bitten by a zombie, requires a daily dose of Zombrex to prevent her from turning into one of the living dead. During his time in Fortune City, a zombie outbreak occurs and Chuck is blamed for the incident.Over the next 72 hours, he must survive the onslaught of the undead and clear his name. Pitted against two fearsome threats – tens of thousands of zombies and the constant countdown of the clock – while potentially rescuing other survivors of the zombie apocalypse, Chuck must also unravel the greater conspiracy behind the outbreak and just as importantly, find the Zombrex necessary to stop Katey from joining the ever growing zombie horde. Developed by Blue Castle Games  in close collaboration with Capcom, Dead Rising 2 takes the acclaimed gameplay the series is known for and pushes it to a new level in zombie-destroying fun. Chuck is quite the handyman and he uses it to his advantage as players are able to take everyday items and combine them with a roll of duct tape to build the ultimate combo weapons to annihilate the undead. A piece of wood and a lawnmower become a Portamower, the handheld mower that cuts zombies down to size in an instant; while a garden rake and car battery combine to create an electrified zombie prod. The more combo weapons a player uses, the more Prestige Points (PPs) they will gain along the way in order to level up Chuck. Ravaging zombie masses is more fun with a friend and for the first time in the series Dead Rising 2 will feature online 2-player co-op play. During the campaign, players can call for a friend at any time by using the in-game transceiver. Once their friend has accepted, they will immediately be brought into the action to play side-by-side with them. Capcom has also released original downloadable content exclusively on Xbox LIVE® with Dead Rising 2®: CASE ZERO. 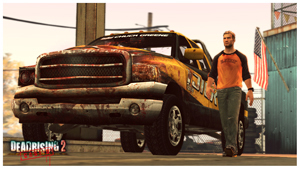 This Prologue consists of unique content not available in the full retail release of Dead Rising 2 and will introduce new protagonist Chuck Greene as he and his daughter find themselves caught in the desert town of Still Creek that has been overrun with zombies. Set two years after the Willamette incident and three before the action of Dead Rising 2, Dead Rising 2: CASE ZERO will help bridge the gap between the two titles and give players a taste of the new gameplay they will experience in Dead Rising 2 as they create combo weapons, rescue survivors and take on a ruthless Psychos before making their escape. Players who just can’t enough of Dead Rising 2, will also be treated to an epilogue, Dead Rising 2®: CASE WEST exclusively on Xbox LIVE that will be released after the game and will feature an old favorite, Frank West. Complimenting Dead Rising 2™: CASE ZERO, Dead Rising 2: CASE WEST will extend the Dead Rising 2 experience by delivering brand new content and the return of a familiar face. 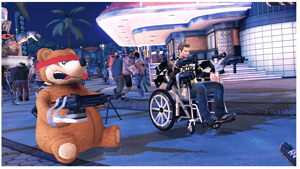 Available exclusively on Xbox LIVE following the release of Dead Rising 2, Dead Rising 2: CASE WEST will see Frank West team up with Chuck Greene for some serious co-op action. In co-op mode, Xbox LIVE gold members will see the two protagonists delve deeper into the reasons behind the Fortune City outbreak and provide further links to the Willamette incident.